More robust enforcement of FARA, a better understanding of the law, and scandal have resulted in more agencies registering as foreign agents this year. (Image via Wikimedia Commons, photographed by w:User:Coolcaesar). WASHINGTON: The number of firms that have registered as foreign agents has surged this year amid greater public scrutiny of agencies acting on behalf of overseas entities. As of November 30, 90 new agencies had registered with the Justice Department this year, a 32.4% increase compared with all of 2016, when there were 68 new registrants. 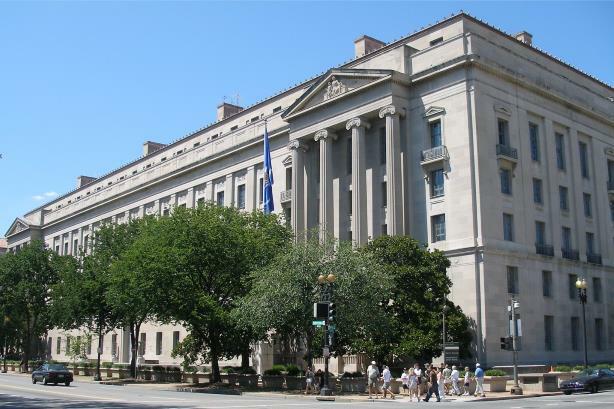 The number of filings was largely steady in 2016 compared with 2015 (64) and 2014 (66), according to the Justice Department’s Foreign Agents Registration Act database. Public attention to FARA requirements has increased since former Trump campaign officials Paul Manafort and Richard Gates were charged with failing to register as foreign agents in October. Former National Security Adviser Michael Flynn registered as a foreign agent in March after conducting lobbying work the year prior to help the Turkish government. The combination of a highly publicized scandal and the threat of increased enforcement has prompted more registrations, said Daniel Pickard, partner at Wiley Rein, who noted a "significant increase in the amount of FARA-related inquiries." "There’s a perception of an increased enforcement environment, especially in light of the stories in the media of late," he said. "That’s increasing awareness among people of the requirements of [FARA], which is likely leading to increased registrations." Put into effect in 1938 to counteract Nazi propaganda, FARA requires firms representing foreign governments or an entity controlled by, funded by, or taking directions from a foreign government, to disclose their financing and ties. The Justice Department’s office of inspector general released a report in September 2016 highlighting the department’s shortcomings in terms of FARA. In response, the DOJ said in a financial report that it would begin to implement its inspector general’s recommendations to counter illicit foreign influence. Sen. Chuck Grassley (R-IA) has also introduced legislation that would strengthen FARA requirements and force registrants to provide supplementary statements every three months. The indictments of Manafort and Gates and accusations that Flynn failed to disclose his work for a foreign government have caused anxiety among agencies that work for foreign countries, said Joshua Rosenstein, attorney at Sandler Reiff Lamb Rosenstein & Birkenstock. Clients have asked Rosenstein to look at their activities and determine whether they should register as foreign agents or ensure they have not made inadvertent misrepresentations, he added. "Because FARA prosecutions are so historically unusual, the industry seems to have responded rapidly to high-profile indictments," Rosenstein said. The Justice Department’s office of public affairs did not respond to a request for comment.